Over the years much has gotten lost as to the real reasons we do things. One of these is clipping wings. Back in the late 1970s and early 1980s very few breeders and hand-feeders clipped their chicks until after they were weaned. The reason for this was to not interfere with the weaning process. Many people think that weaning time is very stressful to a chick. This is hardly the case. It is a very natural smooth process if done correctly. When your baby is starting to cut back on the amount of food he is taking in, you are reaching the weaning period. When you get him out of the container at feeding time, he no longer lunges to get to the food. His mind is obviously on flapping those wings, or perching on the side of the container, or he makes a mad dash to climb up on top of the cage. At this time he may beg for a little food, and he may even eat, if you're lucky. This whole routine becomes a real game, or a real pain in the neck, depending on how many babies you are feeding. If you are experienced at this, it's no big deal, if this is your first time it can be real scary, as it should be. His life depends on you, and you probably don't have a clue what to do about this behavior. Up to this point you've done an outstanding job with your baby. He is healthy, big, and fat. Let's look for a minute at life in the wild. Soon after a chick leaves the nest he must be self-sufficient. He must be able to find food, a place to roost, and above all he must be able to escape predators. If he can do all these things in a very short time, he will be able to live a long, healthy life and probably go on to raise a family of his own. O.K. So our little chick is nearing the time he would be leaving the nest. To stay alive he must be able to escape a predator and that is much more important than eating. His brain says, "Let's stop eating and start flying." Before the fledging chick can take flight he has to develop his breast muscles. That means flapping those wings every chance he gets. Not only does he diligently work those wings, he also has to lose weight to get lift. Our little chick is flapping his wings like crazy and going on a horrible crash diet. He could, at this point, lose ten percent of his body weight. A lot of breeders purposely don't feed so much to the chick that it becomes an overweight chunky baby, that in the end, will have to lose a tremendous amount of weight in order to wean. The day comes when you take him out of his cage, or container, and he takes his first flight. You've been expecting this, so you have taken precautions to cover mirrors or draw the drapes. Well, this little guy is so proud, that's all he can think about doing. A few rounds of the room and now he can think about eating. From the time his tail feathers were about one half inch long, weaning food should have been in his container at all times. When he finally comes in for a landing, and is ready to eat, a few cc's of baby food should be eagerly accepted. If not, then on to the weaning food. He knows he can fly so he can stop that crash diet. Weaning should be a snap. Don't clip yet, we don't want him to regress. He should be allowed out daily to exercise and fly. (Be very careful, use common sense, and lock all the doors in your house, if necessary!) About this time he is driving you crazy. He hasn't eaten formula in a week, only adult food. When he's out, he's all over you. He is very graceful; he can hover like a hummingbird, stop on a dime and turn in mid air. He has learned grace and balance. What a shame to have to clip him. Clip now! Yes, you heard right, clip now. This is the critical time. Clipping too early can cause him to regress and miss the window for weaning. It makes the job a lot longer, harder, and more stressful. He may not learn his balance either, until much later, causing him to be very clumsy. If you clip too late it could make him resentful, or have hurt feelings. From the first flight to clipping should be approximately two weeks. I recommend removing only the first five flight feathers (primaries) from the outer tip inward. After doing so, place your baby on the floor so he can try to fly. He doesn't know that he can't and you don't want him finding out six feet up. Once he figures it out, let him drop over your bed, which provides a soft landing. At this point you are making sure he can't get lift. He should be able to glide downward. If he is still able to get lift you may have to remove another feather or two. Do not take your bird out of doors with this type of clip. A small gust of wind could very easily give him lift. When clipping the primaries, you should clip as close to the base of the feather as possible. Clip each feather one at a time. As you clip, lift the covert feathers up and out of the way, so that you are clipping underneath them. 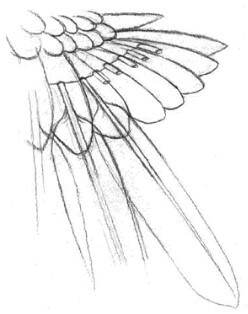 The same should be done for the feathers on the inside of the wing. After the feather is clipped, the shaft stub should be hidden under the coverts forming an envelope of protection. This is especially important with African Greys. They have a tendency to be very uncomfortable when jabbed by a feather stub, which could possibly lead to (heaven forbid) feather picking.